After a 2-0 lead at the half and the Virgin Gorda United cutting the deficit to 2-1 in the 81st minutes, the Wolues ran through their disorganized opponents defense for three unanswered goals late in the game for a 5-1 victory on Sunday. Kevin Carragher opened the Wolues scoring the five minutes into the match, before Leo Forte scored the first of his two goals in the 30th minute, a lead they carried into the half. Xavier John penetrated the Wolues defense in the 81st to cut the deficit to 2-1. The introduction of Alessandro Palladino paid dividends for the Wolues as he netted in the 83rd minute to restore the two goal advantage. Forte grabbed his second in the 87th and Pallandino added his second in the 89th for the 5-1 win. Drury said he thinks his team will be among the contenders as the Islands are the only team that have been a torn in their side. 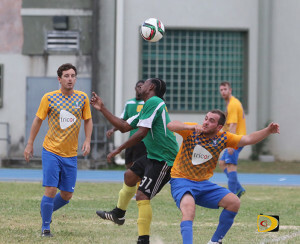 Virgin Gorda’s Glen Bascombe said the game was very bad from his point of view. The Sugar Boys were 5-1 winners over One Love while the unbeaten Islanders blanked the Panthers 4-0. The Rebels toppled Old Madrid, 2-1.